Writing Children's Books with Robyn Opie Parnell: Come on a blog tour with Alphabet Soup magazine! 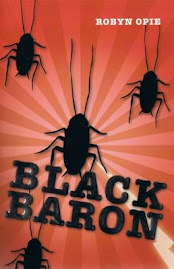 Come on a blog tour with Alphabet Soup magazine! 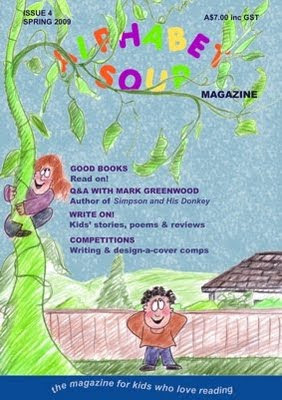 By visiting this blog, you could win four issues of Alphabet Soup magazine. Alphabet Soup magazine is celebrating their spring 2009 issue with a blog tour -- and you could be a winner. From 1 – 7 September, Rebecca Newman (Alphabet Soup’s Publisher and Editor) will visit 7 different blogs, where she’ll answer questions about the magazine. Find out what started it all, how the magazine could be used in the classroom, who’s on the team at the magazine, and more! The spring ‘09 issue marks the magazine’s first birthday. To celebrate, there’s a set of the first four issues to be won. Right here! So make sure you visit this blog on 6 September. What led the publisher to start Alphabet Soup magazine? What goes into ‘whipping up’ an issue of the magazine? ‘First birthday’ giveaway. Win a set of the first four issues! Who’s on the team behind Alphabet Soup magazine?